The bioactive compounds from Javanese turmeric (Curcuma xanthorrhiza Roxb. ), curcuminoid and xanthorrhizol, have been used to treat human diseases. 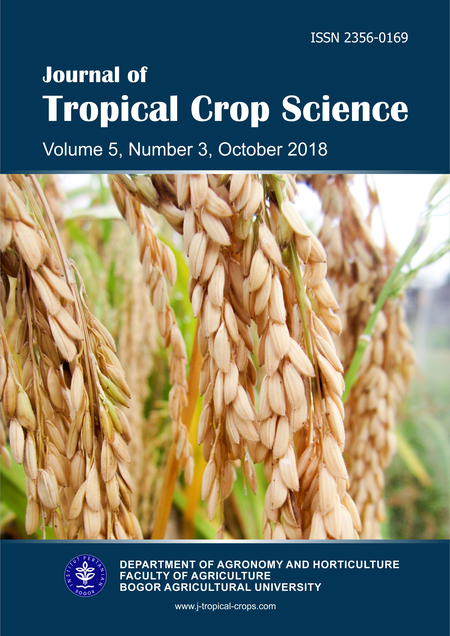 This research aims to study the Javanese turmeric growth, its curcuminoid and xanthorrhizol content using Biso Zyme with different concentration and interval spraying. Biso Zyme is is conjugated enzyme concentrate (CEC) produced by yeast extracts that can be applied to the plant to increase and improve plant yields. The treatments were arranged in a randomized block factorial design with three replications. The concentrations of Biso Zyme were 0.0, 0.1, and 0.05 %, with monthly spraying intervals at 1, 2, 3, 4 and 5 months after planting (MAP). The results showed that the highest leaf area index was 2.71 cm2g-1 followed by leaf area ratio which was 66.47 cm2.g-1 with 0.1% Biso Zyme application. Relative growth rate was 0.048 g.day-1while net assimilation rate was 0.00092 g.cm-2.day-1 without Biso Zyme application. The highest fresh and dry weight was those treated with 0.05% Biso Zyme applied at 4 to 5 MAP, i.e., 444.44 g and 68.72 g, respectively. The highest curcuminoid and xanthorrhizol contents were 0.435% and 1.505%, respectively, with 0.05% Biso Zyme spraying interval at 4 to 5 MAP, and 0.1% Biso Zyme with sprayed at 1 to 5 MAP. Thin layer chromatography (TLC) analysis detected standard curcuminoid at Rf 0.23 and xanthorrhizol at Rf 0.66 with dichloromethane:chloroform eluents. Department of Agronomy and Horticulture Faculty of Agriculture Bogor Agricultural University, Indonesia, Jl. Acosta-Martinez, V., Cruz, L., Sotomayor-Ramirez D., and Pres-Alegria, L. (2007). Enzyme activities as affected by soil properties and land use in a tropical watershed. Applied Soil Ecology 35, 35-45. Ahemad, M. and Kibret, M. (2013). Mechanisms and applications of plant growth promoting rhizobacteria: current perspective – Review. Journal of King Saud University – Science 26, 1-20. Calvo, P., Nelson, L., and Kloepper, J.W. (2014). Agricultural uses of plant biostimulants. Plant Soil 383, 3-41. DOI 10.1007/s11104-014-2131-8. Ghulamahdi, M., Aziz S.A., and Nirwan. (2008). Increasing growth and flavonoid content of Gynura pseudochina (L.) DC clones through lighting periods. Buletin Agronomi 36, 41-47. Ginting, R.C.B., Saraswati, R., and Husen, E. (2006). Phosphate solubilizing microorganism (Mikroorganisme Pelarut Fosfat). http://balittanah.litbang.pertanian.go.id/ document.php?folder=eng/dokumentasi/buku/pupuk&filename=pupuk7&ext=pdf. [Accessed July 25, 2017]. Kalembasa, S. and Symanowicz, B. (2012). Enzymatic activity of soil after applying various organic waste materials, ash, and mineral fertilizer. Polish Journal of Environmental Study 21, 1635-1641. Khaerana, Ghulamahdi, M., Purwakusumah, E.D. (2008). Effect of draft stress and harvesting time on plant growth and xanthorrizol content of Curcuma xanthorrhiza Roxb. Buletin Agronomi 36, 241-247. Moemeni, F., Ghobadi, M., Jalali-hanarmand, S., and Shekaari, P. (2013). Effect of supplementary irrigation on growth analysis of chickpea (Cicerarietinum L.). International Journal of Agriculture and Crops Science 5, 1595-1600. Nurcholis, W., Munshif, A.A., and Ambarsari, L. (2018). Xanthorrhizol contents, α-glucosidase inhibition, and cytotoxic activities in ethyl acetate fraction of Curcuma zanthorrhiza accessions from Indonesia. Revista Brasileira de Farmacognosia 28, 44–49. Peschel, D., Koerting, R., and Nass, N. (2006). Curcumin induces changes in the expression of genes involved in cholesterol homeostasis. Journal of Nutritional Biochemistry 18, 113-119. Purnomo, D., Budiastuti, M.S., Sakya, A.T., and Cholid, M.I. (2018).The potential of turmeric (Curcuma xanthorrhiza) in agroforestry system based on silk tree (Albizia chinensis). IOP Conf. Ser. : Earth Environment Science 142, 1-5. Satyaprakash, M., Nikitha, T., Reddi, E.U.B., Sadhana, B., and Vani, S.S. (2017). Phosphorous and Phosphate Solubilising Bacteria and their Role in Plant Nutrition. International Journal of Current Microbiology and Applied Sciences 6, 2133-2144. Sridevi, V. and Chellamuthu, V. (2015). Growth analysis and yield of rice different as affected by the system of rice intensification (SRI) practices. IMPACT: International Journal of Research and Applied Natural and Social Science 3, 29-36. Vurukonda, S.S.K.P., Vardharajula, S., Shrivastava, M., and Ali, Sk.Z. (2016). Enhancement of drought stress tolerance in crops by plant growth promoting rhizobacteria. Microbiological Research 184, 13-24. Wijaya, S.H., Indrawibawa, D., Suharsono, S., Nakamura, K., and Nishijima, K. (2016). Systems agronomy collaboration between Japanese and Indonesian agriculture industries focused on potato cultivation. CICSJ Bulletin 34, 53-58.